We're in a car. We're in a tunnel. We're heading out of the tunnel. We're somewhere across the river from Manhattan. We're probably in New Jersey. We're not driving. The man who is has a confident swagger as he lights his cigar. This is his kingdom, and his demeanor as he surveys it tells us everything we need to know, even if we don't get a look at him beyond a few passing glances. And the things we see tell us just as much as we need to know about this world, images of industry and decay, of a world that is slowly eroding from within and a country that is built on rot as much as anything else. Across the river, we can see the promise of the American dream, but here, it's all meat markets and smoke belching into the sky and cemeteries faded from age. The one touchstone we can focus on, maybe, is a church, off in the distance, standing above all the grime. Or maybe these small streets of cozy suburban homes that, nonetheless, bear plenty of wear and tear. But this man is a king, and, thus, we're going to his castle, a mansion on a hill, where he can park his car and at last join his family. The last thing we see is our first full glimpse of his face, and it's unreadable. Is he happy to be home? Despairing? Or just tired at the end of another long day? And then we see the name of the show we're going to be watching The Sopranos. A gun takes the place of the R in "Sopranos." So it's that kind of show. The opening credits of The Sopranos tell you everything you need to know about the show before you even watch it. Creator David Chase's vision is of a world that has seen better days, a world that is falling apart, where everyone grows ever more entrenched in their particular kingdoms and rarely steps down from them to consider the effect their actions have. Chase's world is one where people - nations, really - don't change because it's easier not to. People are who they are, and that's never going to be any different, The Sopranos argues. Trying to change them is a fool's errand. Better to just get out of their way and hope to not be collateral damage. It's a cynical and cold vision of the world, but it was also the one HBO drama to ever become a huge, breakout hit. What that says about Americans as a people I'll never know. Well, what it says is that Americans have always liked mafia stories. We enjoy seeing the flipside of the rags to riches storyline, where the person who makes it to riches is ruthless the whole way up. We hope that the people we know are like characters in a Frank Capra film, holding firm to principle and being rewarded for the good they do. But, secretly, we know that only the most cutthroat survive. It's a world for sharks, and both capitalism and democracy tend to reward the shark with the sharpest teeth. 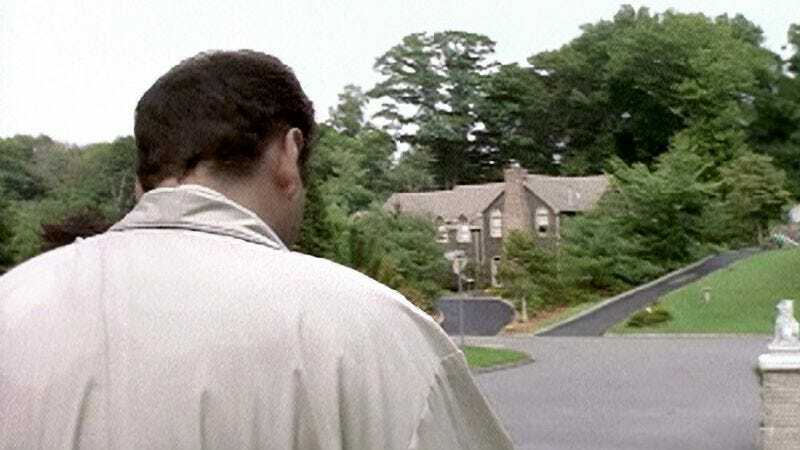 The opening credits of The Sopranos don't situate Tony Soprano as something that operates outside of the system. They situate him as a driver of what's coming, sure, but they also position him as a symptom. Tony Soprano is the natural result of however many years of decay. People who lionize Tony aren't missing the point of the show, as some critics have claimed; they're just not grasping that we get the heroes we deserve, and Tony is as much David Chase spitting in our face as anything else. To say that The Sopranos was an influential show is an understatement. Indeed, it's probably one of the two or three most influential primetime dramas ever made. Hill Street Blues loosened up the rigid, standalone episode format the drama had had up until that point, making the world safe for serialized storytelling. Twin Peaks opened up the floodgates to let in more direct, personal visions (and a whole lot of weirdness). And The Sopranos proved that people were willing to get really invested in a show, to work with it through meditative patches while they waited for the plot to lurch forward. The Sopranos is a dreamlike show in all the best senses of that word, and its bursts of pseudo-artiness are as affecting as its most famous violent outbursts. Making a list of reasons The Sopranos is as important as it is seems like one of those things that would ultimately be pointless. Every time you think of two or three, another two or three pop up in a completely different direction. But briefly, the series proved that adult content could be wedded to a series that was both artistically fulfilling and a hit with audiences. (Though Oz proved similar ideas a few seasons earlier, it was never as big a hit with critics or audiences as The Sopranos was, and while an engaging series in its own right, it never was as wholly successful at articulating a particular personal vision as The Sopranos.) It created a real demand among audiences for antiheroes, a demand that spread out to other cable channels and even network. It slowly made the cable landscape safe for challenging, adult dramas. It turned HBO into a powerhouse that financed much of the best television of the past decade. It wasn't afraid to be meditative or challenging, and the mass audience rarely punished it for that. It was an early adopter of the idea of putting a season on DVD to entice more people to watch the next season (though at least in this case, it followed 24). And I could go on. Virtually every drama on the air today follows at least some part of The Sopranos model. Some of these are more direct ancestors than even they'd admit. Mad Men, from a former Sopranos writer, has borrowed the show's model of having each episode be something of a self-contained short story and then having those short stories add up to something more in the end. Some of these series follow the model less directly but still wouldn't be on the air at all without The Sopranos. Justified, for example, is a show that has less in common with The Sopranos than a lot of solid dramas, but it's still a show with something of an antihero on a network that only got into drama because HBO had been so successful with it. It's rare to have a show on the air that every other show can trace its lineage to, but The Sopranos is that kind of show. And yet, over the past few years, it's gotten a little underrated, I'd argue. That seems like a silly thing to say about a show that's had more articles written about it than any other show ever (and most of them ridiculously adulatory), but the combination of the way the show grew increasingly chilly over the seasons with the way its finale was perhaps its most challenging episode ever has led to a scenario where people who liked it at the time still mostly like it but perhaps prefer some of its near contemporaries (like, say, The Wire). And for people who've never seen it, it's a daunting task, far longer than any of the other big HBO dramas and made with a tone that inspires more respect than fawning adoration. When I push The Wire DVDs on someone, I tend to speak of it in the glowing terms I use when pushing something I love on someone. When I ask them to watch The Sopranos, I tend to speak more in terms of the show's general importance, even though at its height, I loved the show just as much as I still love The Wire. Other shows inspire adoration. The Sopranos inspires reverence. Plus, it's the middle section in a loose trilogy of shows HBO did that say as much about what it was like to live in America in the late '90s and 2000s as any other work of art. If Deadwood is a show about the birth of a nation, messy and disorganized as births tend to be, and The Wire is about that nation's inevitable death, weighted with a sense of the way the world works to destroy you as most deaths tend to be, The Sopranos is the big, cold middle, the section that's just about hanging on to what you have as long as you can, even though hanging on to it is eroding your soul inexorably. It's about how you get from birth to death, about how being an adult inevitably tears you apart inside and the moral choices that lead you to that point. (You could toss Six Feet Under into this organizational concept as well, but it's my article, and I've never liked it as much as these other shows.) Nobody wants to watch the middle chapter. Also, let's face it. Most TV drama dates really badly. The show that was cutting edge even five years ago can start to feel creaky as other shows take its ideas and improve upon them. (For some reason, the really good sitcoms don't have this problem, perhaps because what's funny is always funny, while what's relevant is only relevant for a short while.) Hill Street Blues, mentioned above, is still a good show, but for most people, it's going to feel like a historical curiosity more than one of the most important dramas ever produced. I feared The Sopranos would fare similarly when I looked at it more critically than I did when it first aired. There was every chance that rewatching the first season would feel like some weird time capsule that would seem too austere and unapproachable. But the pilot, undoubtedly one of the most important episodes of television ever (and I promise I'll stop saying "important" soon here now), still mostly holds up. Sure, there's the usual gleeful cackling at, say, Meadow's computer and Internet connection or Carmela's very '90s wardrobe, but this is still an episode of television that feels like it could have aired just yesterday. Hell, it feels damn prophetic, the last few gasps of an empire that's realizing the worst is ahead. What comes after we get out of that car? We're in an oasis, a place that reeks of culture, modernity, and upper-class assumption. Dr. Melfi's office, introduced to us for the first time in the episode's first shot, is a place that practically screams "I'm taking all of this for granted," and one of the pleasures of the series is how Melfi confronts the unlikely intersections between her life and Tony's life, the way that they are simultaneously joined together by some pretty convincing things but also separated by a wide gulf of ethics and morality, one that Melfi will be tempted to cross now and again. The pilot has its episodic plot - something about Christopher trying to deal with the Triborough Towers situation and an attempt to clear out Artie Bucco's place so Uncle Junior can perform a hit there (though this plan rapidly evolves) - but for the most part, it functions as almost all HBO pilots function, using this one as a model: It's an introduction to the world we're going to inhabit, to the major characters we're going to follow. All pilots are, to a degree, statements of purpose and invitations to trust the show's producers. But HBO pilots are even more like this than other network's pilots. They're an attempt to set the tone and suggest what kind of show you'll be watching as much as anything else. For as many plot wheels as The Sopranos sets in motion, what hangs over the pilot now is the unavoidable sense of doom that the show trafficked in so heavily over the years. I was honestly surprised at how many of Tony's most famous speeches come in the pilot. I knew that the speech about how he worried he'd come in at the end (and Melfi's response that a lot of Americans feel that way) was here and the show's initial statement of purpose, but I had forgotten the Gary Cooper speech was here and the speech about how everyone could feel a little happier. David Chase is very clearly laying the groundwork for the kind of show he's going to make, even before he makes it. There are gleefully entertaining moments of mob violence (as when Christopher and Tony run down the doctor in the car or Christopher's hit on "E-mail"), but the big sense the pilot gives off is of a thing in decline, of a world that is no longer as it was and is sliding toward destruction. It's interesting, I think, that the pilot bothers so little with defining Tony as a person. The great debate of The Sopranos always hinged on just how much of a bad person Tony was and whether or not the audience was supposed to identify with him or find him a little offputting. While Chase would definitively come down on one side of this debate as the show drew to its close, in the pilot, he seems to go out of his way to portray Tony as just another guy, granted one who's in something far worse than waste management (and the loopy way Chase uses what Tony says and what he actually does against each other throughout the pilot is one of the best things about it). The ducks in Tony's swimming pool are one of the most acclaimed devices in the pilot, and while Tony suggests his sadness over their leaving is really sadness over his family leaving, it doesn't really ring true. The ducks, swimming in that pool, are happy and carefree, finally able to escape when they figure out how to fly. Tony has his castle, yes, but it's also a prison, and the series will be about his various attempts to take flight and the ways various things - circumstance, other people in his life, his very nature - prevent that from happening. In the future, these pieces will focus more on the episodes themselves. This week, I wanted to take a look at the series as a whole, however. We'll be doing two episodes a week from here on out, and we'll get through seasons one and two this summer. If I didn't discuss something you particularly enjoy in the pilot, please bring it up in comments. And I'll make more of an effort to talk about the episodes in general in the weeks to come, perhaps even having a quotes section if there's enough demand. This is often a very funny show. As far as grading goes, I'm probably just going to give every episode an A for now. There are points when the show deserves less, but I don't know that they come in the first two seasons. I'm impressed with just how subtle so many moments in the pilot are. Tony's speech about why he's sad about the ducks is probably one of the moments that doesn't ring true (though I'd argue it's not supposed to), but the show doesn't point neon arrows at the fact that, say, the restaurant manager tells Tony he hasn't seen him in ages when he's there with both his wife and mistress. The show is already confident in its ability to tell these stories without losing us. For those who always wanted more mob violence on the show, the pilot is a pretty good argument that this is not where the show's interests lie. There's violence, sure, but the show is signaling that it will be less about mafia plots (as the one in the episode is almost shunted off to the side) and more about the people involved in those plots. In an episode full of great, instantly crystallizing character introductions, the introduction of Livia Soprano stands out as the best. There's a reason this character was the show's breakout character in its first season, and it's too bad Nancy Marchand never won an Emmy for the role before her untimely death (something we won't get to until next summer). Finally, I'm really looking forward to unpacking this season over the summer with you, particularly this first season, which it seems like all TV fans love. In particular, I'm looking forward to "College," which is one of the show's peaks.